The PRAFO® Orthosis, is a totally adjustable, custom-fitted Ankle Foot Orthosis that can help manage many of the ankle/foot anomalies your patients present to you. With recumbent patients it is used to prevent pressure sores at the heel or malleoli areas due to pressure from a mattress. As the structure uses a metal upright structure it resists the development of plantarflexion contractures when muscle tone might be high - for example in early stroke rehabiltiation. Preventing contractures AND heel ulcers can make a big difference to the potential for rehabilitation. Using the 650SKG can accelerate the prospects for rehabilitation by allowing safe ambulation at the earliest opportunity. As rehabilitation progresses, the same device can be used to provide protection and control during ambulation. There are several variations of this product line which consist of different sizes (adult, pediatric and infant), liner options (Kodel®, Fleece, Terry Cloth, Polyurethane Foam or Pad & Strap) and a variety of color options. One of our most popular varients is the PRAFO 650SKG. Also, this line is equipped with optional accessories that help complement secondary needs. Keep in mind, we’re practitioners and designers, and we’ll help guide you in choosing the most appropriate AFO system based on patient etiologies, cost and applications. If in doubt please contact us for assistance in providing your patients the correct model. NOTE: The posterior ankle strap is shown inside the upright in the photos. When fitted properly, the strap is outside the posterior upright bar. 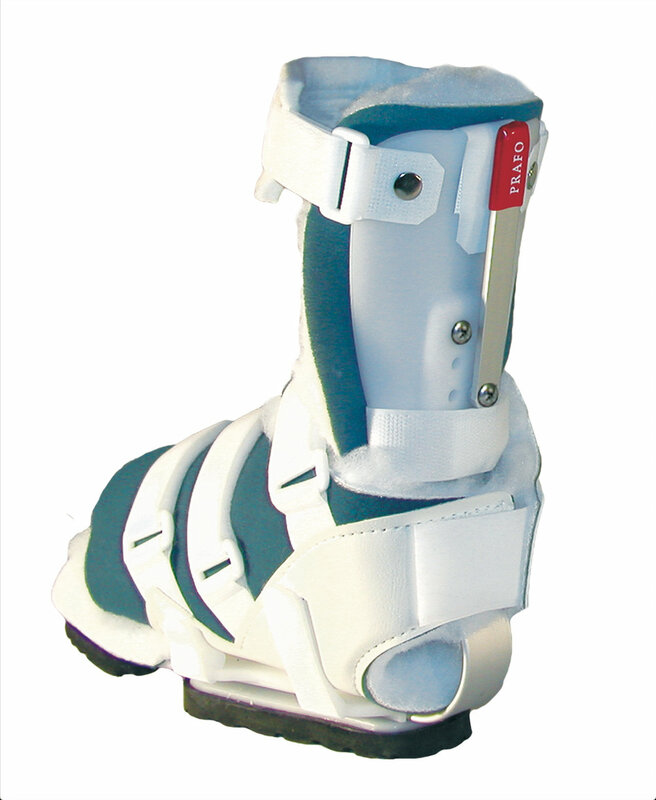 The design is a great choice for Immediate fit, early Intervention in acute or sub acute rehabilitation of the patient. The device is suitable for left and right and adjusts to various foot and lower-limb sizes. The design has been refined in over 25 years of clinical experience around the world. It is designed for both ambulant and walking situations and uniquely has a metal upright. This is important in many situations to resist deformity development and for safe ambulation. Specific options to enhance alignment and support of the ankle and foot are available (e.g. VCA, Plastic stabilising shell.